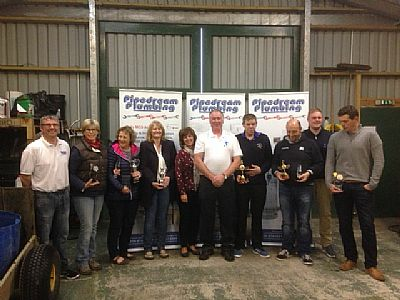 Last Saturday saw a total of 55 entries, men and women, for our Pipe Dream Plumbing open at South Ronaldsay Golf Club. The weather just about stayed kind to us throughout but unfortunately some rain did fall in the later stages. However, this did not dampen the spirits of those taking part and some great scores were returned. Men - 1st Gross with 71 was Barry Reeve. 1st Nett with 61 was Stevie Linklater. Longest drive on the 8th was Graham Flett. 1st Nett (on countback) with 76 was Sheila Hourston. Nearest the pin on the 15th was Lynn Shearer. Longest drive on the 8th was Shona Slater. A huge thank you must go to our sponsor, Andy Gunn of Pipe Dream Plumbing for once again providing fantastic prizes for this event. Thanks also to Ben, our greens keeper and the hard work of committee members for the condition of the course. Thanks to Alex and Jacqueline Rosie, Davie Nicol and all others who helped on the day. Stevie Linklater tells me he is enjoying playing this course, but don't panic Stevie, the ditches will eventually get you.